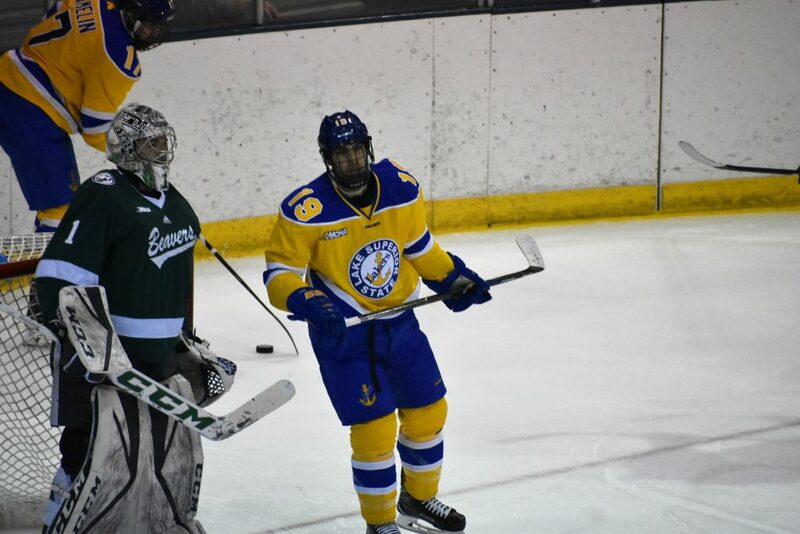 ANCHORAGE, Alaska – Anthony Nellis’ eleventh goal of the season propelled Lake Superior State to a 3-2 overtime win over the last place Alaska-Anchorage Seawolves in late night hockey action at the Sullivan Arena in Anchorage. The win was the third straight for the Lakers (9-20-4, 7-15-3 WCHA), who swept Bemidji State last weekend. Will Riedell got the scoring started when he rifled a shot from the top of the circle past Seawolves goaltender Olivier Mantha. For Riedell, it was his second goal of the season, and his first since November 3rd. Coincidentally, that goal also came against Alaska-Anchorage. Lake Superior made it 2-0 later in the period on a power play. With Tad Kozun off for tripping, Hampus Erikkson collected a pass from Gage Torrel right in front of Mantha. The native of Forsbacka, Sweden, knocked the puck in the net off of the crossbar. The Seawolves (2-23-4, 2-18-3-3 WCHA) struck back before the period ended, as Jeremiah Luedtke deflected shot from the blue line by Kozun behind Lakers goaltender Nick Kossoff, closing the gap to one goal. With 1:09 left on the clock, the Lakers went into the dressing room after one period holding a 2-1 lead. Nether team found the back of the net in the second period. The Seawolves, who outshot Lake Superior 12-8 in the opening session, continued their barrage on Kossoff, as they held a 24-14 advantage after 40 minutes. Alaska-Anchorage tied the game exactly midway thru the third period, when Nicolas Erb-Ekholm fed a pass to Alec Butcher, who beat Kossoff on the short side. With neither goaltender surrendering a goal thru the remainder of regulation, the teams went to overtime for the second time this season. Just like last time, the Lakers were victorious, as J.T. Henke dug a puck out of the corner and slid it through two Seawolf defenders to a streaking Nellis, who buried the puck for a 3-2 win. In goal, Kossoff picked up his seventh win of the year by making 31 saves on 33 shots. Across the ice, Mantha had 22 saves on 25 opportunities. The win helped move Lake Superior to 24 points in league play, four behind Ferris State, who currently holds the final playoff spot. The Bulldogs are idle this week and play Minnesota State next weekend before the final games of the regular season against the Lakers. By taking the loss, the Seawolves were mathematically eliminated from the WCHA playoff race. Alaska-Anchorage currently has 12 points on the season, and cannot pass Ferris State’s 28 points with their remaining schedule. The two squads will conclude their series tonight. Faceoff is set for 11:07 p.m. Eastern.